A close-up of a man's hands making meatballs. Skip the multi-meat mixtures, spice mixes, chopped veggies and egg wash if you want to make quick, easy meatballs. After you've learned how to make basic meatballs for pasta sauces or sandwiches, you cant then start experimenting with different ingredients and cooking techniques. Even if you're not a pro in the kitchen, you can make tasty, healthy meatballs without a lot of fuss and mess. Buy ground beef or turkey, depending on how healthy you want your meatballs to be. Ground round has the least fat of ground beef choices, with turkey breast the lowest-fat turkey choice. Your meatballs is will be moister if you used a fattier meat, but if you are covering them with tomato or some other sauce, lower-fat meat will produce moist and tasty meatballs. A rule of thumb for buying ground beef is that the more expensive, the less fat — the opposite of buying steaks. Combine your room temperature meat and the bread crumbs into a bowl and thoroughly mix with your hands. Begin adding the milk a little at a time to create a meatball consistency that is not too dry or wet. Your goal is create firm meatballs, using the bread and milk to bind the meat, not become main ingredients. Let the meat do the talking. Add salt and pepper to taste. If you're not sure how much to use, start with a 1/2 tsp. of each, adding another 1/2 tsp. each time you make your meatballs in the future. Roll one meatball to the size you desire and put it on a plate. Let it sit for one minute or more. If the meatball does not change shape, you have used the correct amount of binding ingredients. You should be able to tap it with your finger and not have it crumble. If your meatball sags or collapses, put the meat back into the ball and add more bread crumbs. Be careful to add bread crumbs a little at a time. Adding too much can make your meatballs a chewy mouthful of flour. Shape your meatballs when you have the right consistency and put them on a plate. Heat a frying pan with 1 tbs. of olive oil or other monounsaturated fat, such as peanut, saffron or canola oil. Over medium heat, cook one meatball until it is completely brown on the outside. Turn the meatball carefully, only cooking each side once. The more you press and play with meat, the more moisture you lose. Cooking them on high may result in a crusty outside and rare instead. Your total cooking time should be less than five minutes. Remove the meatball and cut it open to see if it is cooked through. The meatball should not be red or pink on the inside. If it is, add more minutes to your cooking time. Fry the rest of your meatballs, turning the pan during the cooking process. Some burners do not heat evenly, making some parts of the pan hotter than others. Remove meatballs from the pan and place on a rack to cool. Do not place the meatballs directly on paper towels or they will sit in their own fat. 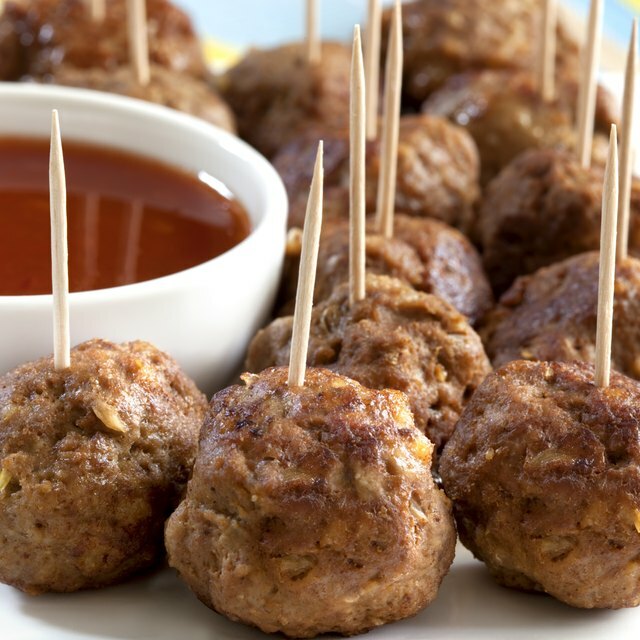 Bake meatballs on a rack for healthier meatballs. Finish cooking meatballs by dropping them into your tomato sauce after sauteing them. Add finely diced onions, carrots and/or celery for more flavor in future recipes. Use an Italian spice mix for more flavor. Sprinkle with garlic as soon as you take them out of the frying pan or oven. Alternatively, you can use an egg, instead of skim milk, to bind your meatballs.